You can use versions and environments to manage and update large, complex chatbots in an organized way that doesn’t expose working drafts of a chatbot to users. What’s a version and why are they useful? A version is a package of your bot training dataset and skills. Each version is independent of the others and can be managed individually. For example, you might want to create a new version prior to major updates to your training dataset or skills. Or you might want to create two or more variants of the same core bot for different audiences. Note: Once you enable versioning for your bot, you can’t disable it. Go to the Settings page for your bot. Under VERSION SETTINGS, activate versioning. At the top of the page, you’ll now see a dropdown to create and switch to different versions. How do I create a version? By default, your bot has only one main version v1. You can create a new version under VERSION SETTINGS or in the dropdown near the bot name. Click CREATE NEW VERSION and select the version you want to copy. This copies the Train and Build tabs of the source version and creates a new version that you can then name. The new version is a pure copy; you can update the new version or the old one separately. Note: Bots are restricted to five or fewer versions. Each version has a dedicated request token. 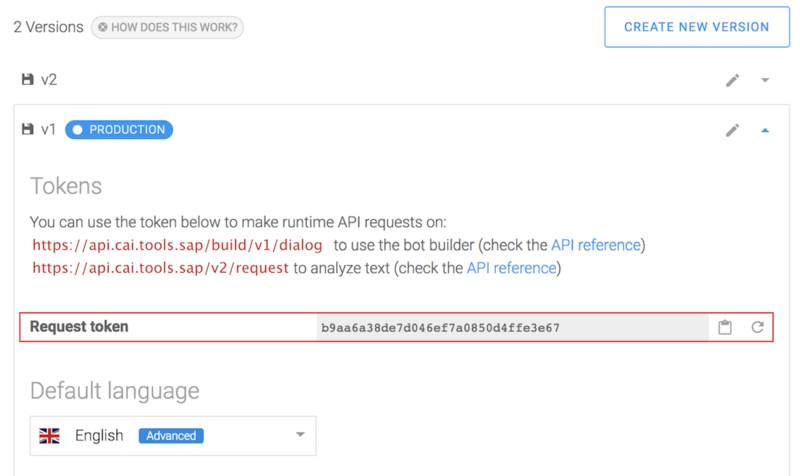 This means that if you want to analyze a text with the /request endpoint or use the Bot Builder API with the /dialog API, you have to provide the request token from the version that you want to use. Environments are configurations applied to specific versions and help you to seamlessly deploy your chatbot in production. They are best leveraged as specific consumption environments, for example, Development, Staging, and Production. When you first enable versioning, your first version v1 is associated and linked to the environment production. You can create and name additional environments in the VERSION SETTINGS area under Environments. Each environment is always linked to a specific version. On the Connect tab, you can connect each channel to a specific environment. This means that you can have a Facebook Messenger channel for your DEVELOPMENT environment and link this environment to version v2, and have a Facebook Messenger channel for your PRODUCTION environment and link this environment to version v1. Each environment has a dedicated request token. This means that if you want to analyze a text with the /request endpoint or use the Bot Builder API with the /dialog API, you can either provide a version token or an environment token. If you provide an environment token in your request, it uses the version of your chatbot that is linked to this environment. How do versions + environments work? Since each environment is linked to a version, it’s really easy to deploy a new version to a production environment. Here you have two Facebook Messenger channels: one for the DEVELOPMENT environment and one for the PRODUCTION environment. The v1 version of my bot is in the PRODUCTION environment. The users chatting with my Facebook Messenger page Awesome bot are chatting with this version. Let’s say I’m working on a different version v2 and I’m testing it on the DEVELOPMENT environment with another Facebook Messenger page. I’m pretty comfortable with this new version and now I want to deploy it to the PRODUCTION environment. 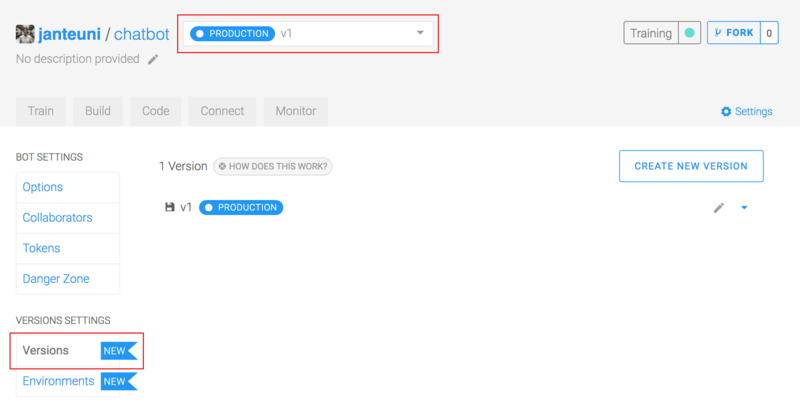 On the Settings page for my bot, I go to VERSION SETTINGS and change the version that is linked to the PRODUCTION environment. Now the PRODUCTION environment is linked to the v2 version of my bot. The users on my Facebook Messenger page Awesome bot can now talk to the new version of my bot. You can assign a version to multiple environments. However, you can assign only one version to each environment. How does the Bot Builder API (without Bot Connector) work? If you’re directly using the Bot Builder endpoint /dialog without a channel in the Bot Connector, the best practice is to use environment request tokens and not version tokens. In your code, when you request SAP Conversational AI and send a message, it will always be on the same environment, for example, the PRODUCTION environment. When you need to deploy a new version of your chatbot to your users, you just need to go to the Settings page for your bot and, under VERSION SETTINGS, change the version that is linked to the PRODUCTION environment. You don’t need to change the request token in your code because it’s the same environment that you’re requesting; you simply switch to a different version on the Settings page. On the Monitor tab, you can filter all of the metrics by environment and version. For example, you can opt to see only the log feed for the STAGING environment or only the usage metrics for the PRODUCTION environment.